Roy Harper has had quite the journey, from Green Arrow sidekick Speedy to the problematic Arsenal, all tattoos and trucker hats. He’s battled several addictions, even lost a limb here and there, but one of his bad decisions became the bright spot of his life when he learned he was the father to villainess Cheshire’s daughter, Lian. There’s something incredibly relatable about seeing the Teen Titans take turns bouncing baby Lian on their knee—it can be hard being the first one of your friends to have kids, but when one of your babysitters is Nightwing, you’re in good hands. No list of dads in comics would be complete without Alison Bechdel’s haunting memoir of her father, Bruce. What begins as a slightly embittered search for answers surrounding her father’s death becomes a reflection on the traits they do share, from heartwarming similarities to deeper questions of identity—and the self-acceptance that only one of them could find. While it’s now a Tony-Award-winning musical, Bechdel’s cartooning brings a patience to her story that reflects the slow unfurling of true understanding. Under Grant Morrison’s revisionist run on the title, the Bat not only finds time to sow his own wild oats, but he gathers up the fruits of his (and others’) efforts along the way. The poster dude for Daddy Issues, Bruce ranks pretty high when it comes to the "angry controlling dad" trope, but come on: there’s no more famous dad in comics and he certainly did his best. Also: few other men in a cape and cowl could control Damian Wayne, the grandson of Ra’s al Ghul who bears some of his granddad’s penchant for mayhem and murder. And though Damian hasn’t quite represented the nobility and mastery of his Dad’s legacy (yet), he’s certainly been led on the right track. Bigby Wolf is protective Alpha Dad to the max. As the Sheriff of Fabletown, he can come across as gruff, but loves nothing more than his wife, Snow White, and their seven kids. He’s undertaken missions and challenges just to live happily ever after with his family—and is there anything sexier than a hot wolf dad who fights for his cubs? No? Just me? Okay then. While Cable, aka the gun-toting X-Force leader Nathan Summers, is better known for his famous dad (Cyclops, the jerk), we’d like to recognize his fatherly role in the life of the Mutant Messiah, Hope Summers. Cable goes from pouch-powered super soldier to super nanny once he becomes the custodian of the first post-M-Day mutant baby, Hope. There’s something about those giant '90s ropey mutant muscles cuddling a baby instead of power-punching that makes me all warm and fuzzy inside. Father, author and slayer of witches, Charlie Rook is an all around super-dad. In most horror stories, parents don’t get a great rap. But think of Scott Snyder and Jock’s Wytches as the anti-Babadook, where the super bond between a kid with problems and her awesome dad saves the day. Power Man turned into Family Man in one of the best character updates in recent memory. After his kung-fu twosome days with Danny Rand, Luke Cage and Jessica Jones hooked up to make baby Danielle—yes, he named her after his best friend. My heart. Luke has just enough of a temper to be a super badass, but nothing turns him into a mushball like his girls. The Master of Magnetism himself. He hits the list for a host of reasons, among them the coveted “badass granddad” status possessed only by legendary nerd greats like GoT’s Tywin Lannister. You know if he were your dad, he’d make sure to tell you that you were totally better than everyone else, and that’s special. Despite their father's frequently villainous ways, his children Scarlet Witch and Quicksilver (YES THEY ARE STILL HIS CHILDREN) turned away from fighting against humanity on mutantdom's behalf to join up with the Avengers. We also love Polaris, the oft-excluded third sibling. Even his twin grandsons are superheroes, so this Super Dad's powers transcend generations. If you’re somehow not reading Saga (it’s like, do you even listen to us? ), Brian K. Vaughan and Fiona Staples tell the sci-fi epic of Hazel and her cross-species parents, Alana and Marko. Alana’s a tough soldier and Marko’s her pacifist captive, so of course they get naked and make a baby—but hey, what a great love story. Marko is an absolutely adoring father, one of the most loving, understanding and gorgeous man-babes in publication, so thanks for that, Fiona Staples. While he’s better known for his TV parallel played by Andrew Lincoln, Rick Grimes is still one of the most prominent dads in comics. But while the bond between Rick and his quickly aging son Carl remains sacred, their lives are not. The story of The Walking Dead once centered heavily around that relationship, but writer Robert Kirkman now says that no one is safe, and Rick might not be long for this world. If one of the greatest leaders in the zombie apocalypse shuffles off the mortal coil, at least he spent the time to train a true chip off the old block, even while staving off sadistic despots and shambling corpses. Father’s Day is about so much more than the department-store basics of new ties and golf accessories. Dads are as different and diverse as anyone else—even if they’re all our heroes. 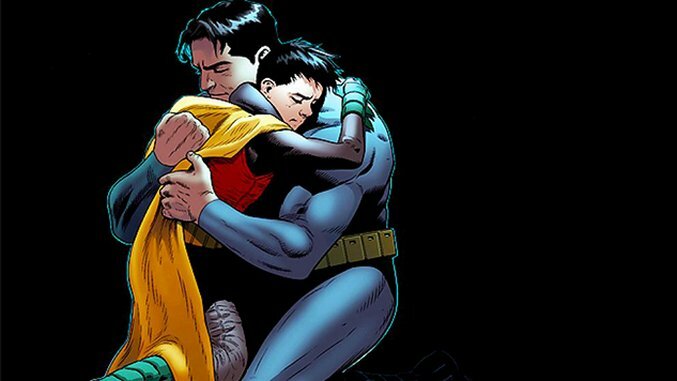 And speaking of heroes, we turned to the pages of some of our favorite comics to pick our ten favorite dads: the good ones, the bad ones and the just plain hot ones, because what’s Father’s Day without recognizing a few hot dads? So when you’re ready: Hi Ready, I’m Dad.